I decided to “upgrade” my generation 3 electronics to use a real stepper motor driver instead of the PWM hack non-sense. For those who don’t already know, the Makerbot electronics are not really designed for Mendel, and specifically the extruder controller is designed to run a gearmotor instead of Mendel’s stepper motor. The Mendel firmware was “hacked” to make the gearmotor controller push 12v through a 2.3v stepper motor but, by making the gearmotor controllers simulate PWM output (which reduces the output power) it doesn’t blow the stepper. From the perspective of re-purposing existing electronics, the idea is a “really neat hack”, and in theory it should just work. Needless to say that in practice, in my experience, the extruder controller makes the stepper run hot, and with a high pitched squeak coming out of it at all times. Re-wiring the motherboard to use a separate extruder is quite a simple task, just connect the SCL output of the motherboard to the Dir pin of the stepper driver, and the SDA output to the Step pin. However when I came to do this myself I didn’t have and couldn’t find this vital bit of information. So using a multimeter connected to the powered up motherboard I tried to determine which output should be connected to which. Well in the process of probing around I managed to short +5v to GND. I heard a fssssszt noise and saw a flash come from the motherboard….oh no! 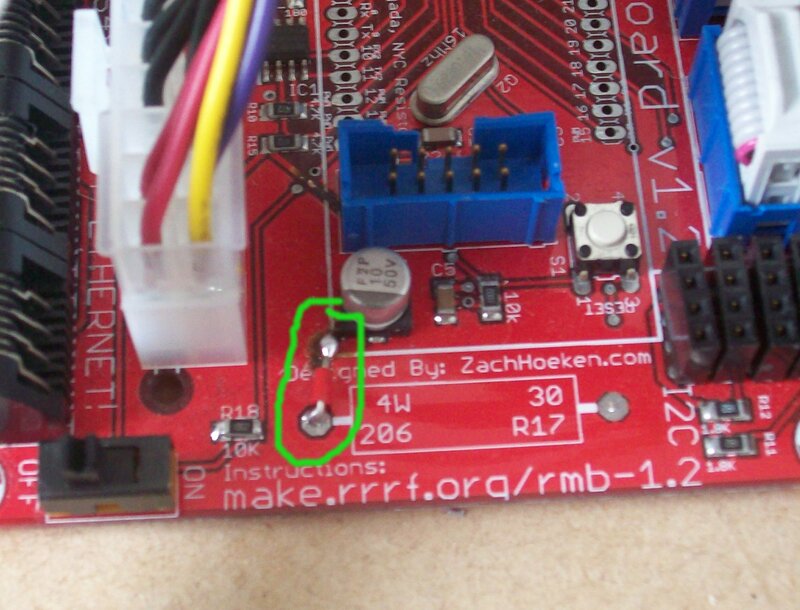 Well I think I managed a lucky escape, one of the tracks on the Motherboard had acted as a fuse and blew, so with the bit of repair shown above circled in green, the motherboard was working again. I should have looked harder for that vital bit of information, and I would have saved myself a headache. I notice you also connect the signal gnd. I should probably do the same as I am currently just relying on the gnd from the power source. With a bit of tuning, and some gearing, the extruder controller works pretty well as a stepper driver – I’ve got two of them running now, and have printed a Mendel with them. 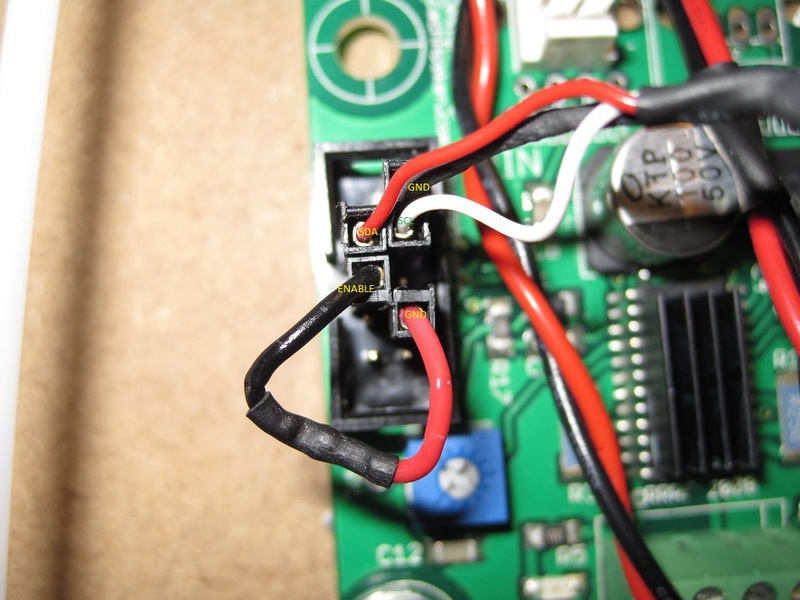 The trick is to set the PWM low enough that you don’t cook your steppers – it’s not like we’re trying to drive the extruder stepper anywhere near it’s top speed (where a proper stepper driver would really help). You can also crank up the PWM frequency if the 1 kHz noise gets to you – there’s some notes in the firmware code about how to do it, although they are a bit confusing. Using a Nema17 stepper for the extruder is pretty overkill though – we should probably be using much higher gearing and a much smaller stepper, to keep the weight and cost down. But for now it works. Previous Previous post: PLA – For less warp.